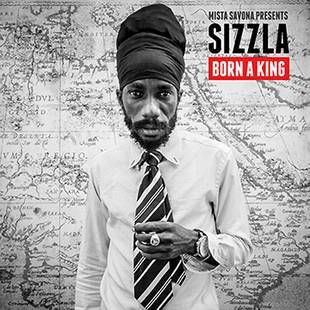 Hip-hop is in the air on Sizzla’s new album Born a King. And so is dancehall, roots reggae and sounds from Africa and the Middle East. Heavyweight Australian producer Mista Savona pulls all the stops and has managed to put out a progressive and blazing mix of styles that fit Sizzla’s fierce and fresh delivery very well. I heard about this set three years ago when I interviewed Mista Savona. He had just dropped the excellent compilation Warn the Nation and revealed the exciting news. I’ve been longing ever since and the longing became even more intense when singles started to drop. First out was the Errol Dunkley combination Champion Sound, later followed by I’m Living, The Formula, a duet with Vida Sunshyne, and Blessed. All singles have felt like a punch in the face thanks to their pounding beats. And beats is the right word here. Because Born a King often leans more towards booming 90s hip-hop and dancehall from the same period, yet put in a contemporary habitat with louder bass, clever sampling and the use of a ten piece studio band. Sizzla sounds more inspired, personal and energetic than usual. He chats, sings, deejays and spits consciousness and combines his sense for melodies and flow over the 15 tracks. On tracks like Blessed, Set it Off and Why Does the World Cry he’s at times so aggressive that those tracks could be used for building up a momentum before a boxing match. The press release for this album uses words and terms like “breath-taking”, “peak of his musical career” and “one of the best albums of Sizzla’s career”. Usually press releases exaggerates, but in this case I have to agree. It’s wickedly well-produced, balanced and detailed. So this scorching set is definitely one of the strongest sets from Sizzla’s more than extensive catalogue. Born a King drops on May 6.